The paper describes three new tissue deformation algorithms. We present a Mass-spring simulation with a quasi-static modification of the Euler integration to increase the stability of the simulation. A directed length correction for springs and an algorithm called Dragnet are suggested to enhance propagation of large local displacements through the Mass-spring mesh. The new algorithms are compared with methods already in use. 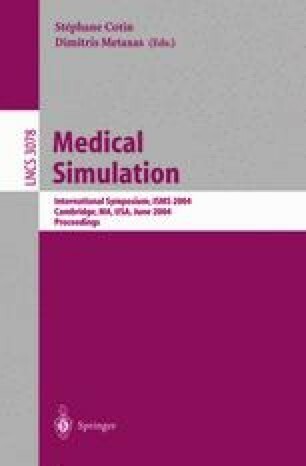 The combination of Dragnet and the quasi-static Mass-spring modification is used for the interactive real-time simulation of an ophthalmological procedure, the removal of the Internal Limiting Membrane (ILM).